Four physicians from Cuba are working in Chicago to improve maternal health and birth outcomes in Englewood. 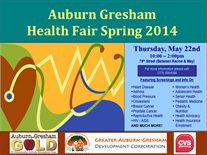 Join Greater Auburn-Gresham Development Corporation (GADC), Auburn Gresham Gold School™ and Elev8 programs as they present the Spring Health Fair on the Block. This bi-annual fair will have lots of health-related vendors and professionals offering free material and key information about your health. Come out and take advantage of numerous health screenings too!